Community Meeting – WTF! Police at Pride? The vast majority of Pride Toronto members voted to support all of Black Lives Matter Toronto’s demands. Why has Pride Toronto invited the police back? What can we do to overturn this? The meeting is organized by Queer Ontario and many community activists opposed to the police as an organization being let back into Pride. 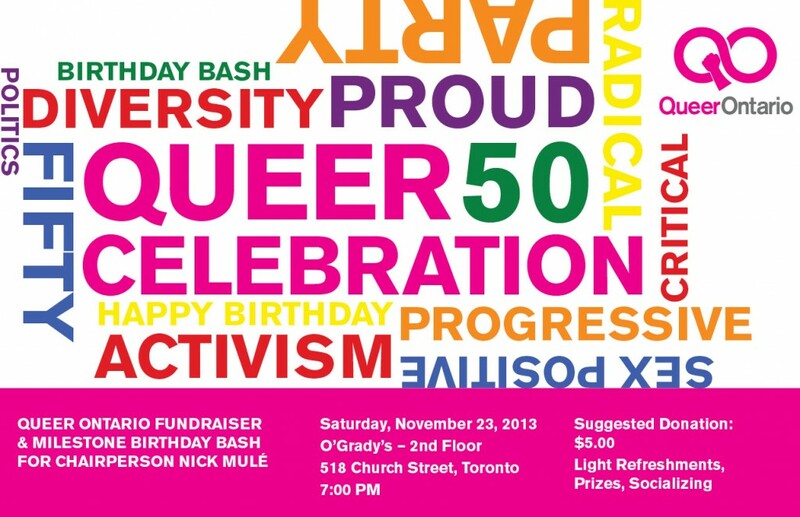 This is just a quick note to let you know that the Queer Ontario ‘Queer Celebration’ Fundraiser and Nick’s Milestone Birthday Bash will now take place at The Vic in Toronto: 580 Church Street, 2nd Floor Function Room. Our Fundraiser will still take place on Saturday, November 23, 2013, from 7:00pm onward.